Bootie LA: Classy vs. Trashy! Los Angeles Bootie LA: Classy vs. Trashy! Dress up or dress down! Whichever you decide, come dressed to party! 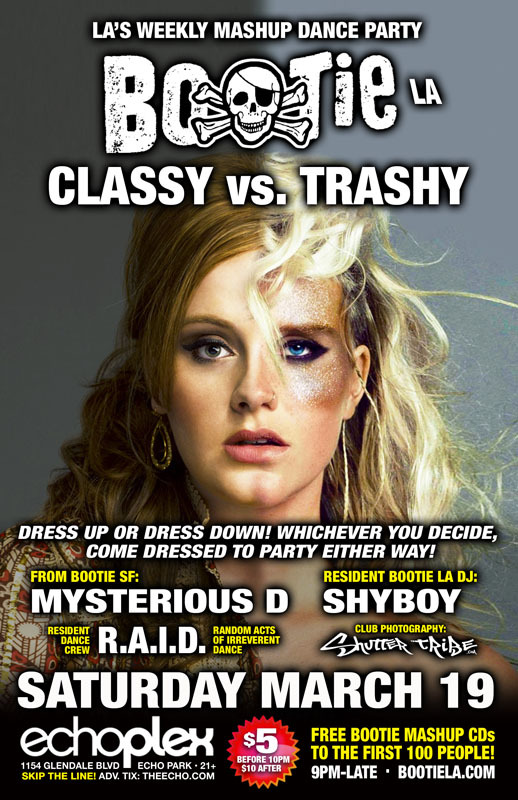 Mysterious D comes down from Bootie SF to join Bootie LA resident DJ ShyBoy as they mix and mash the classiest and trashiest artists from every genre, combining them with songs from every era, all night long! R.A.I.D. will be throwing down some glamorously messy go-go moves all night, and of course Shutter Tribe will be there to capture it all!